1892 northeast Florida map showing towns and cities as well as railway routes and private canal (inland waterway) routes along with promised land grants for opening up transportation in Florida. In 1881, the Florida canal company asked for and received a state land grant of 3,840 acres for every mile of waterway dredged. Henry Flagler asked for the same land grant for every mile of railway track laid. But Flagler was years late in making application because the Legislature had reserved for granting more east coast land than the State possessed. A mathematic error made more times than mere happenstance would allow. Graft? Corruption? The author leaves it to the reader to speculate. 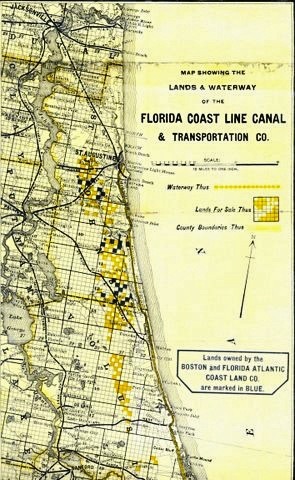 In any event, with Author’s tongue fully in cheek,Flagler stopped construction of the Florida East Coast Railway “in its tracks” at Titusville, vowing that he would not complete the railway to Miami unless landowners and cities along the way, including the Florida canal company, chipped in their fair share of state land grants. This entry was posted in Uncategorized on January 26, 2015 by Florida's Big Dig.